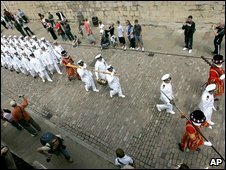 A US Navy vessel has become the first non-British ship to take part in a ceremony at the Tower of London that dates back hundreds of years. The USS Halyburton was involved in the Constable's Dues ritual, which involved the crew being challenged for entry into the capital. It mirrors an ancient custom in which a ship had to unload some of its cargo for the sovereign to enter the city. 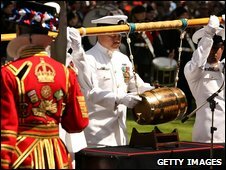 The ceremony dates back to the 14th Century. Saturday's recreation of the ceremony began when the captain of the USS Halyburton, Commander Michael P Huck, led his crew to the Tower's West Gate. There they were challenged for entry to the Tower by the Yeoman Gaoler armed with his axe. They were then marched through the Tower of London to Tower Green, accompanied by the Beefeaters in scarlet and gold state dress and a corps of drums. The commander then delivered a keg of wine, representing the dues, to the Tower's Constable, Sir Roger Wheeler. The constable was the sovereign's representative and would have been among the most powerful men in the city. The USS Halyburton is currently moored in South Dock at London Docklands where it arrived on Thursday for a three-night stay.